While waiting for the sun to set at the North Point Nature Preserve I noticed the quantity of milkweed growing in the area. 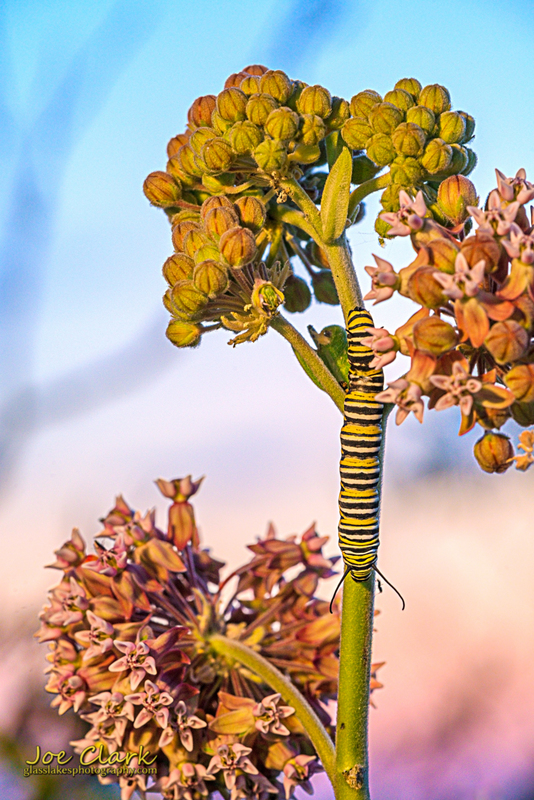 Knowing that milkweed is the sole source of food for a growing Monarch caterpillar I then started searching for them. I noticed this one on the second plant I inspected, it was also the only one I noticed. This image is a candidate for the forthcoming conservancy series, more details to follow. During the sunset, and with the fading light I was able to capture this image using color filtered off camera strobe. After multiple exposures to capture the plant with minimal movement this was achieved. Nikon D800 with 150mm f/2.8 Macro, 1/13th f/10 ISO 800 with off camera flash.